How about a little Shlemenko vs. Cooper action from last night? 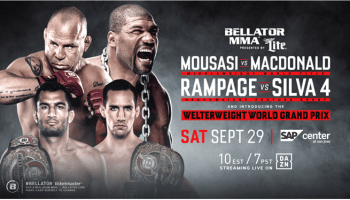 Last night we saw a hell of a brawl for the Bellator middleweight championship when old foes Alexander Shlemenko and Brett Cooper met for the second time in the Bellator cage. It was a back and forth fight that was a hell of a lot of fun, so I won’t spoil it here, you should just watch it in all of its awesomeness.